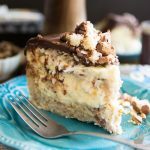 S’mores Cheesecake Bars, it’s all the deliciousness of a classic Smores and the dreaminess of a creamy, tangy cheesecake rolled into a truly decadent treat! What started with a not-so-little tattoo project that I wanted to have done on my back ended up turning into a complete and proper backpiece. All in all, this beautiful masterpiece took something like 30 hours to complete! As you can very well imagine, this wasn’t done all in one go: I had to pay regular visits to my tattoo artist. And then, as I was having this backpiece done, I sort of fell in love with the work of another one of the resident artists there, so decided to have a fairly large piece done by him as well, on my forearm this time. Now, if you ever got tattooed, I guess you’re no stranger to the amount of stress that it can put your body under. We’re talking pain, and lots of it, for several continuous hours. 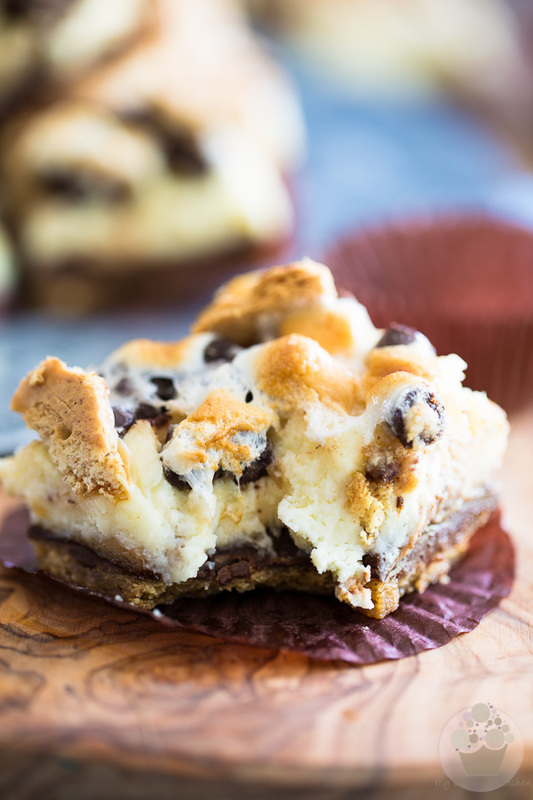 Under those rather extreme conditions, a little picker-upper in the form of something like one of those S’mores Cheesecake Bars right here, for instance, feels like TOTAL BLISS. The sweet sugary goodness feels like it literally soothes your soul the second it hits your tongue. Because of that, I quickly came to consider my visits to the tattoo shop as the perfect opportunity for me to whip up a bunch of goodies: not only would I have a little something to sooth my own soul when it needed it, but I would then have plenty of good people to take care of all the leftovers for me. Haha! Think they’ll miss me when I’m all done getting inked up? I’d like to think so! So anyway, all this to say that these S’mores Cheesecake Bars are what I’d chosen to bring to comfort my body and my soul the last time I went for an ink session. Oh my goodness did they ever hit the spot! My soul couldn’t have asked for a better balm. 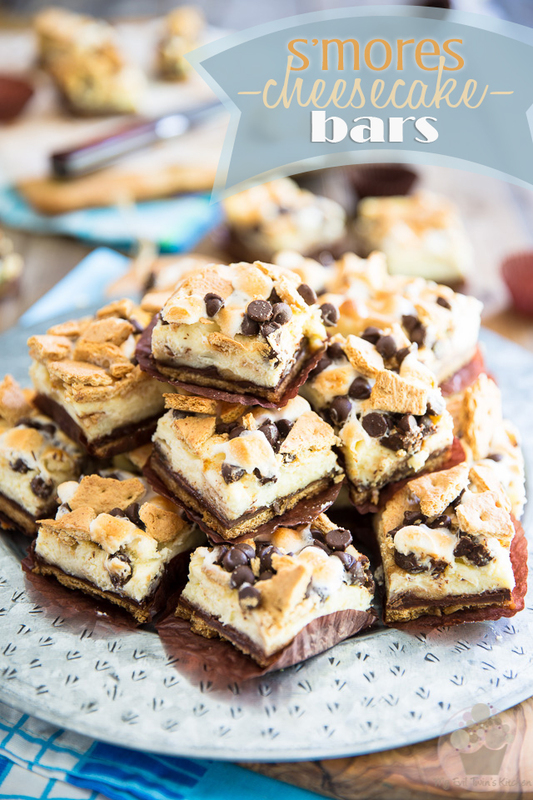 These bars, they’re sweet and sticky and gooey… but most of all, they’re seriously YUMMY! 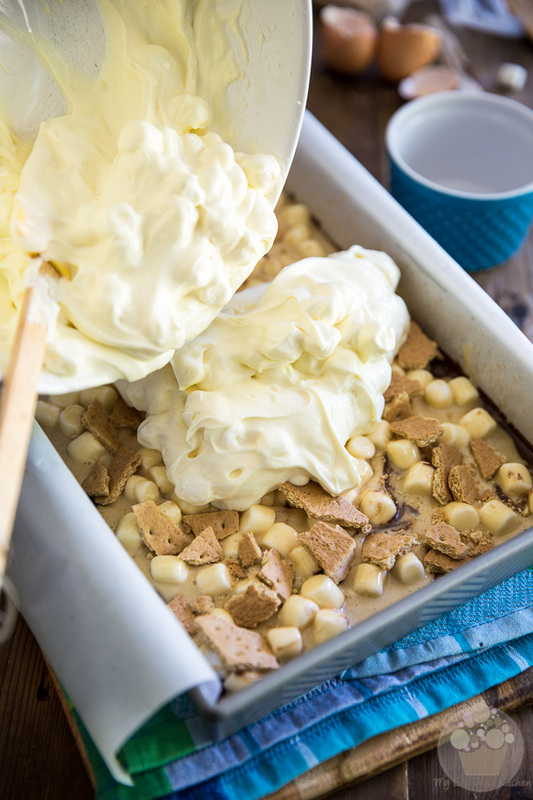 I wanted my cheesecake bars to have a really S’mores-y feel to them, so I chose to use whole sheets of graham crackers to make the crust, instead of the traditional graham cookie crumbs. And then I covered that crust with a generous amount of chocolate. 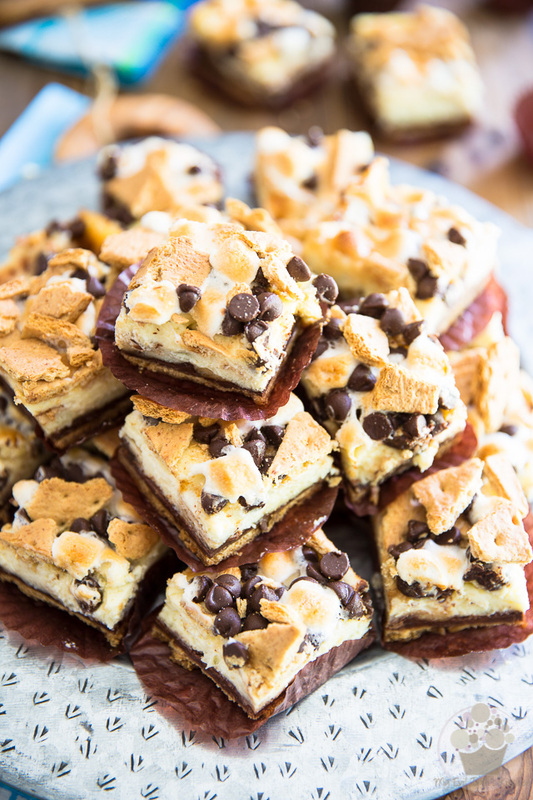 Because of course, you can’t have S’mores without a generous amount of chocolate. 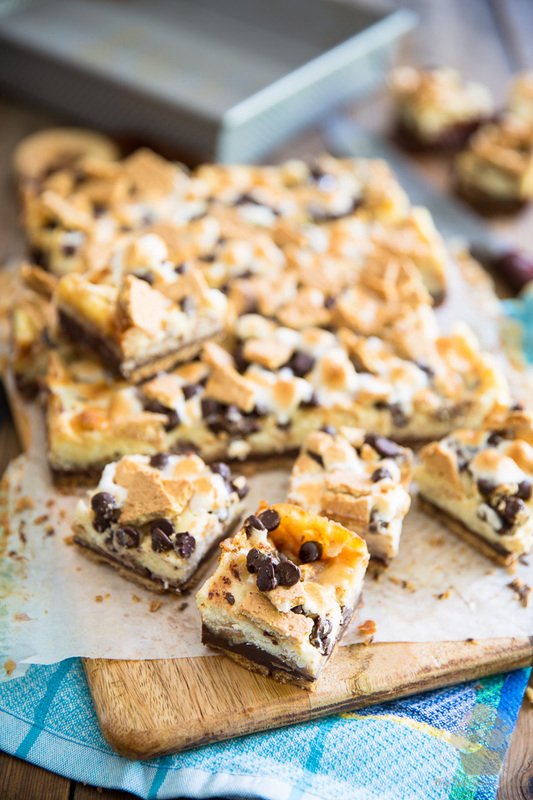 But since to me, S’mores are really a celebration of the beautiful, fluffy and chewy thing that is a marshmallow, I wanted my cheesecake bars to be LOADED with the fluffy little things. And THAT, they are. Not only did I choose to add marshmallows to the cheese filling and to throw a generous amount of them over the bars to sort of garnish them, but I also dedicated an entire layer to them. We’re talking hoards of mini marshmallows coated in a mixture of melted marshmallows and butter. Oh! the dream! The sticky, gooey, crunchy, chewy, fluffy and sweet dream! 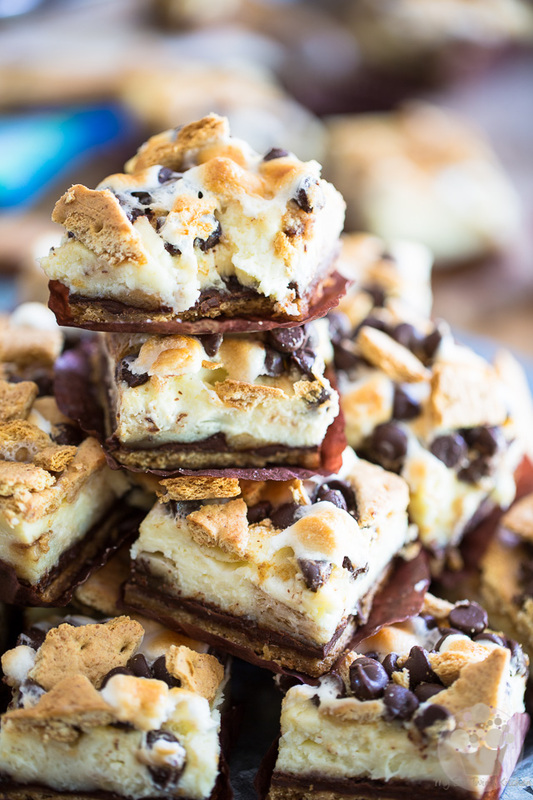 If like me, you’re a real fan of S’mores AND a true cheesecake aficionado, then I can guarantee you’ll be all over these S’mores Cheesecake Bars. 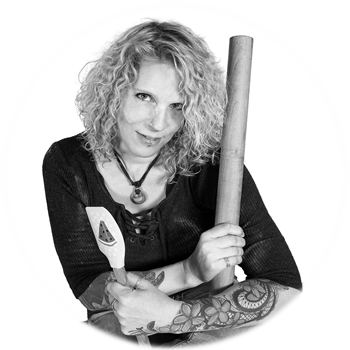 Grease and line a 9″ x 13″ baking pan with parchment paper, leaving a bit of an overhang on either side for easy removal of the finished bars. 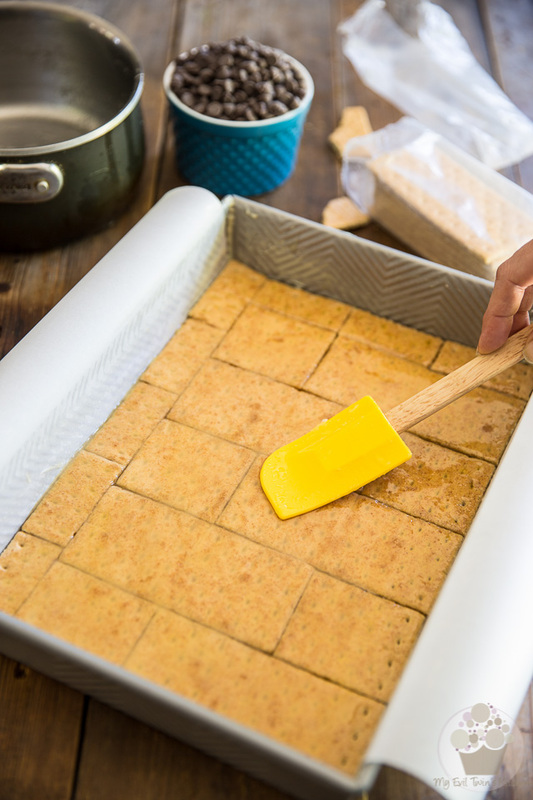 Arrange the graham crackers in a single layer at the bottom of the prepared pan, making sure that they touch on all sides. 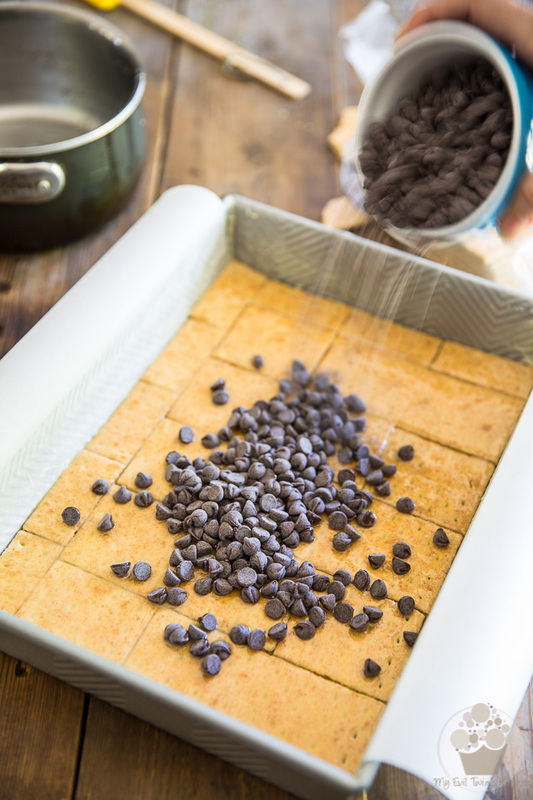 Now sprinkle and distribute the chocolate chips evenly over the crackers and send the pan to the oven for 8 minutes. After 8 minutes, take the pan out of the oven and immediately spread the melted chocolate chips over the crackers with a small offset spatula. Don’t worry if the chocolate chips aren’t perfectly and completely melted. It’s okay to still feel tiny little lumps of unmelted chocolate as you spread away. 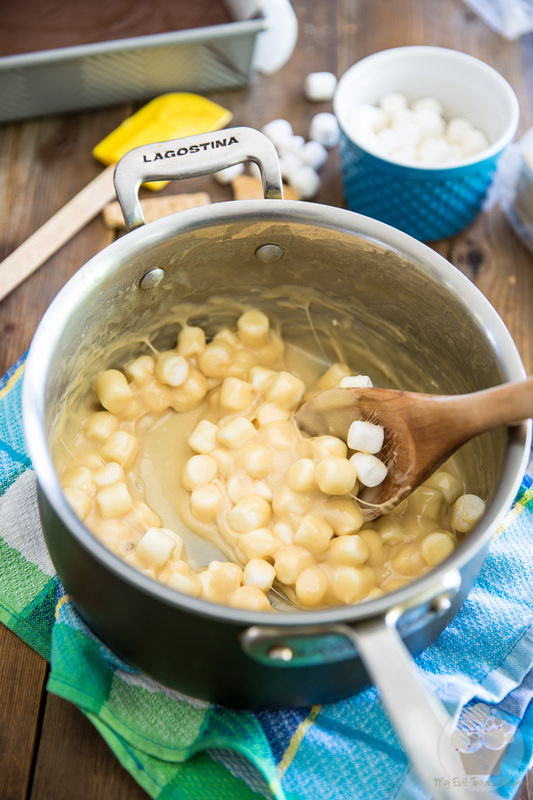 Combine 4 cups of the mini marshmallows with the butter and vanilla extract in a medium saucepan. Cook them over medium heat, stirring constantly, until the marshmallows are completely melted; remove from heat. Throw in the remaining cup of mini marshmallows and stir until they are incorporated with the melted marshmallow mixture. 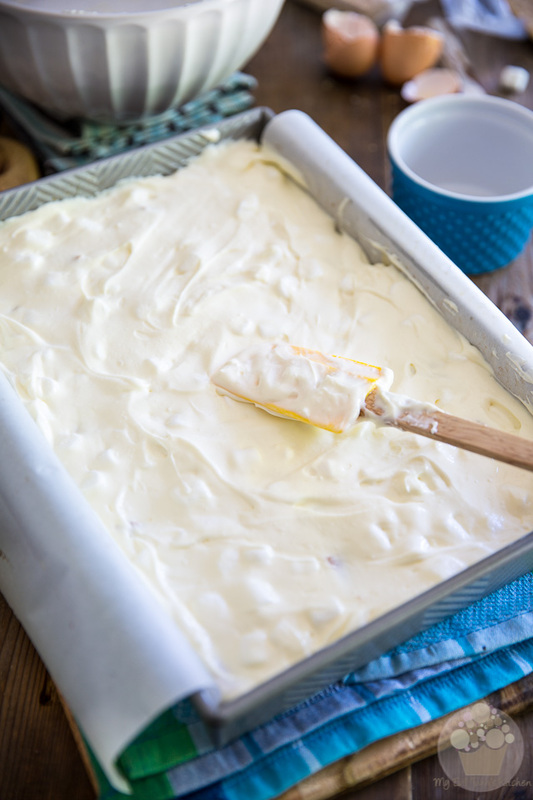 Drop this marshmallow mixture by large spoonfuls over the reserved crust. 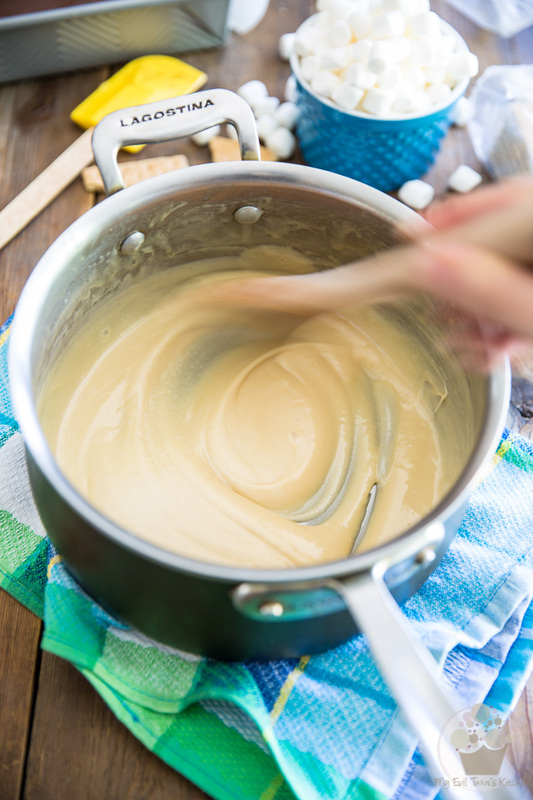 It is a bit sticky, that mixture, and doesn’t spread all that well, so don’t worry if it gets mixed in with the chocolate a little bit, that’s perfectly fine. 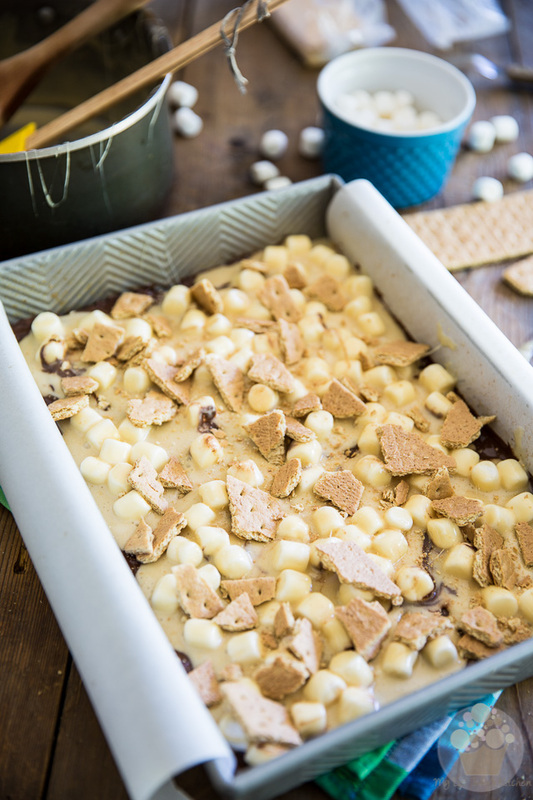 Now sprinkle 3 full sheet’s worth of broken pieces of graham crackers over this layer of marshmallows and set the pan aside once again. Time to make some yummy cheese filling! 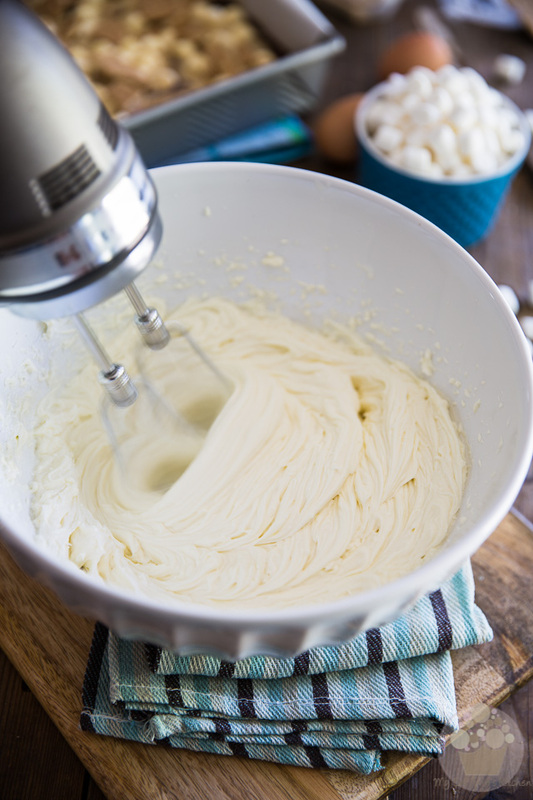 Beat the cream cheese, sour cream and sugar together with an electric mixer until they are well combined and perfectly smooth, which should take around 2 minutes. 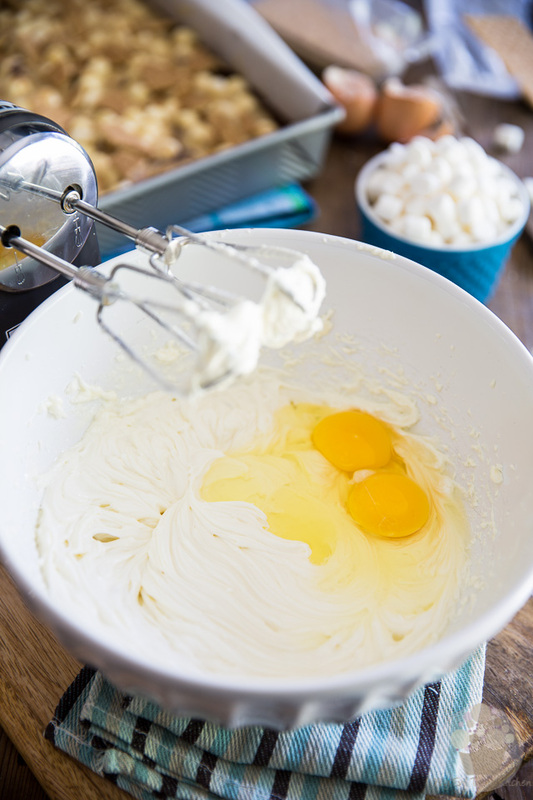 … and resume beating until the mixture becomes light and airy, about 2 more minutes. …and then pour this delicious filling over the reserved crust. 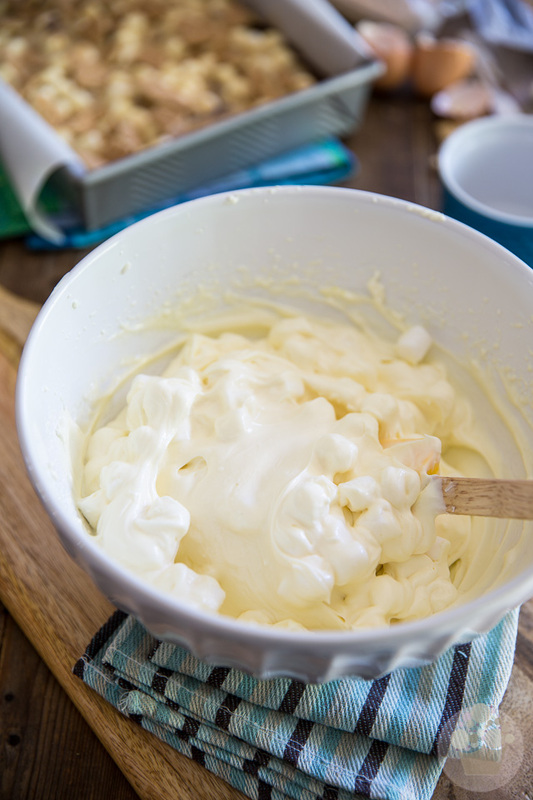 Spread the cream cheese filling evenly all the way to the edge and then return the pan to the oven. This time, you’ll want to leave the pan in there for 25 minutes. We’re not quite done, though. There’s still the matter of the top garnish, you know. We gotta take care of that! 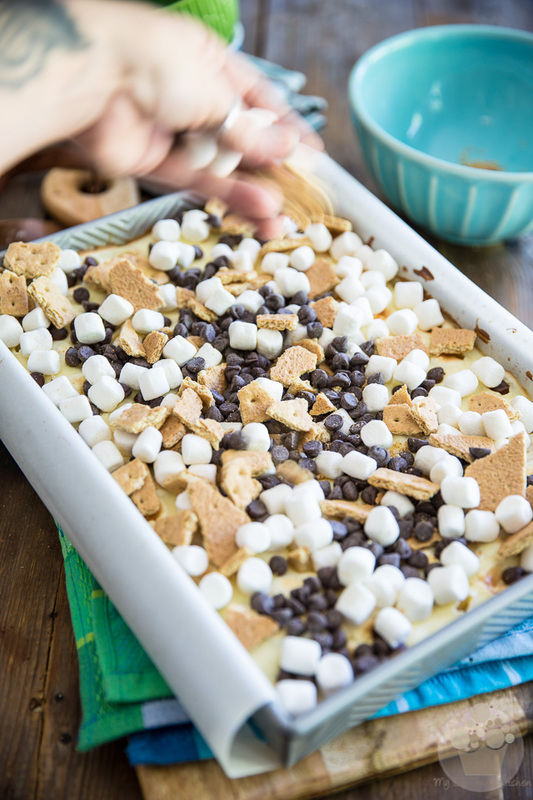 While the bars are in the oven, break up 4 more sheets of graham crackers and throw the pieces into a large bowl, along with the semi-sweet chocolate chips and mini-marshmallows; mix until well distributed. 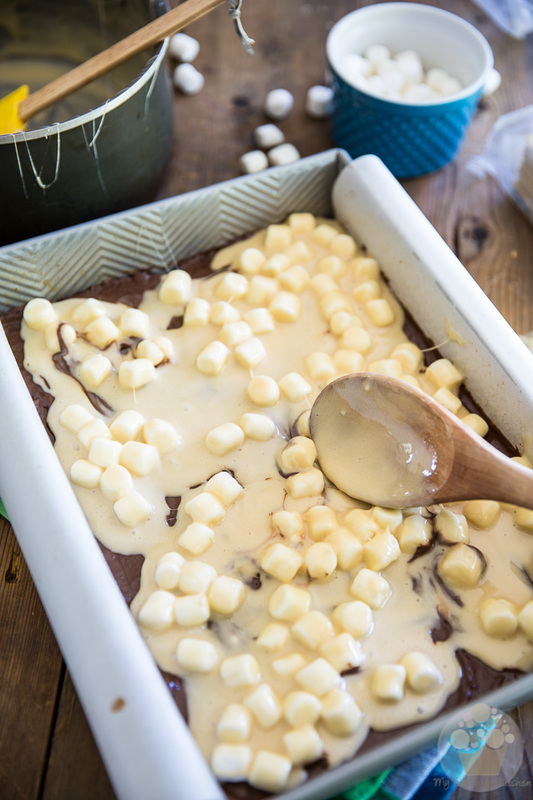 After the bars have baked for 25 minutes, take them out of the oven, sprinkle this lot of goody good goodies all over their top and then return the pan to the oven for another for 8 to 10 minutes, until the marshmallows start to puff up and turn golden brown. Remove the pan from the oven and let the bars cool to room temperature, then transfer them to the fridge to chill completely, AT LEAST 6 hours, but preferably overnight. 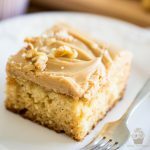 Lift the bars out of the pan by pulling gently and slowly on the parchment paper and then place them on a cutting board to slice them into individual bars. I found the best way to do that was with the help of a long serrated knife, which I made sure to wipe clean after each cut. Store your finished bars in the refrigerator for up to a week. Grease and line a 9" x 13" baking pan with parchment paper, leaving a bit of an overhang on either side for easy removal of the finished bars. 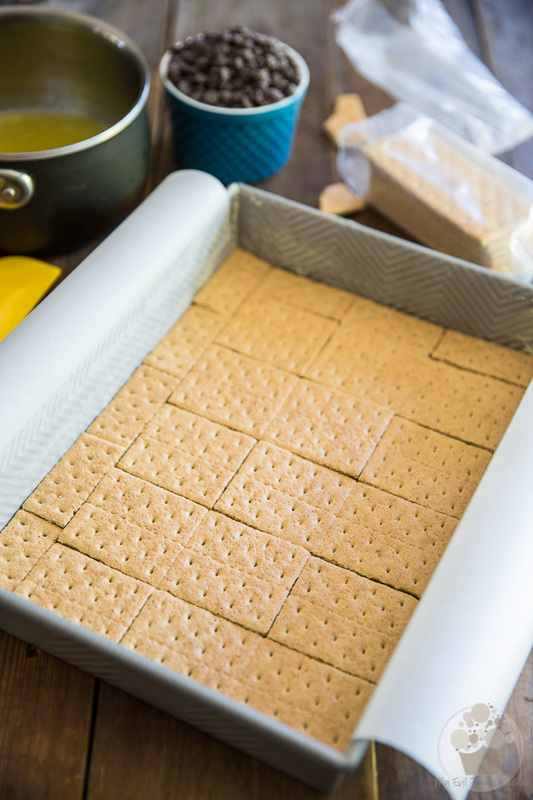 Arrange the graham crackers in a single layer, making sure that they all touch, at the bottom of the prepared pan; set aside. 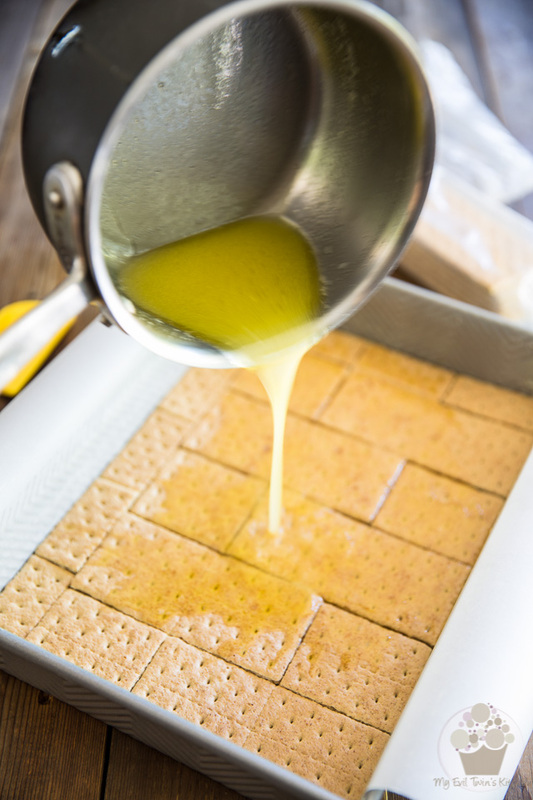 In a small saucepan, melt the butter and sugar over medium heat and then pour the mixture over the graham crackers; spread evenly over the crackers with a rubber spatula. 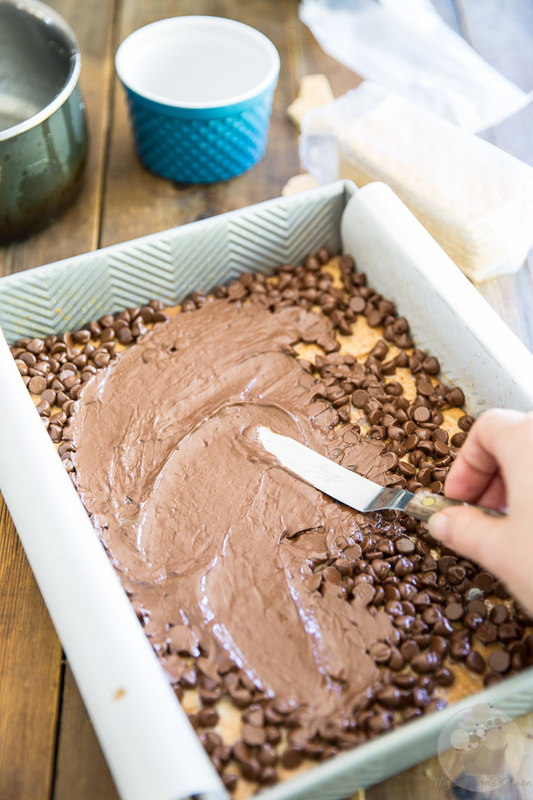 Sprinkle and distribute the chocolate chips evenly over the crackers; Place the pan in the oven and bake for 8 minutes, and then immediately spread the melted chocolate chips over the crackers with an offset spatula. Set aside. Drop this mixture by large spoonfuls over the reserved crust and then sprinkle with broken pieces of graham craker cookies. Set aside. 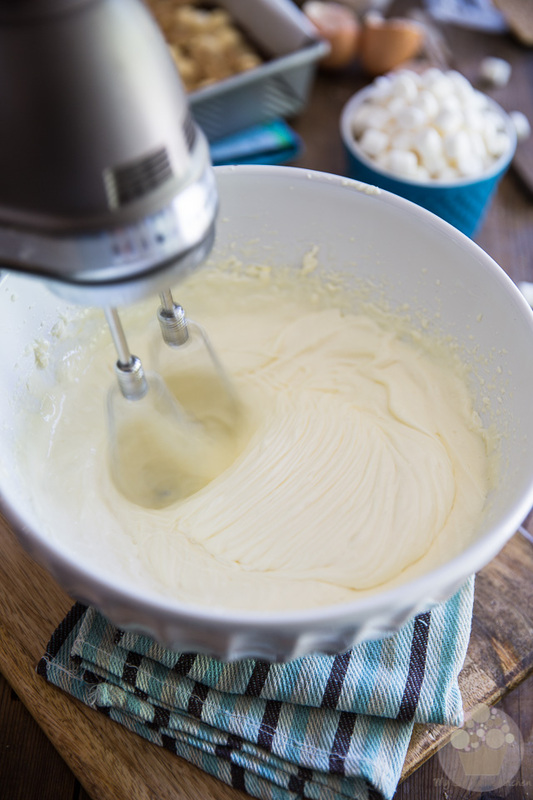 Beat the cream cheese, sour cream and sugar with an electric mixer until well combined and smooth, about 2 minutes. Add the eggs and resume beating until light and airy, about 2 minutes. 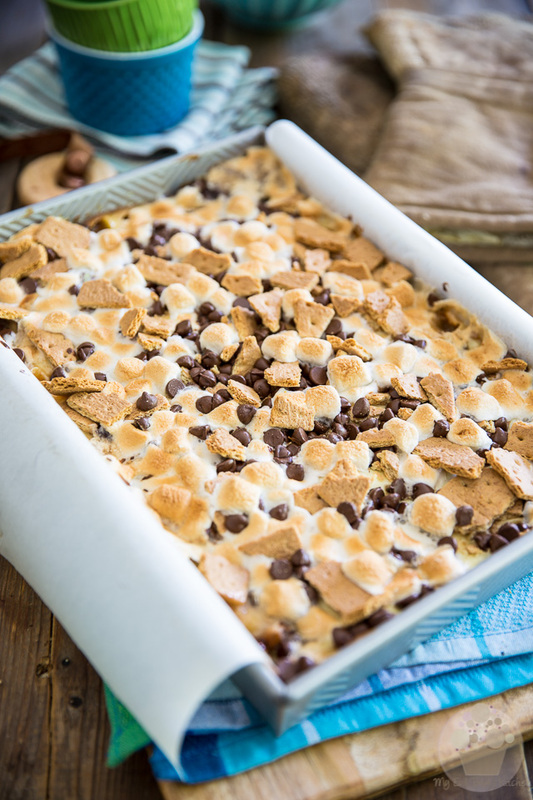 Stir in the mini marshmallows and then pour this filling over the reserved crust. Return the pan to the oven and bake for 25 minutes. 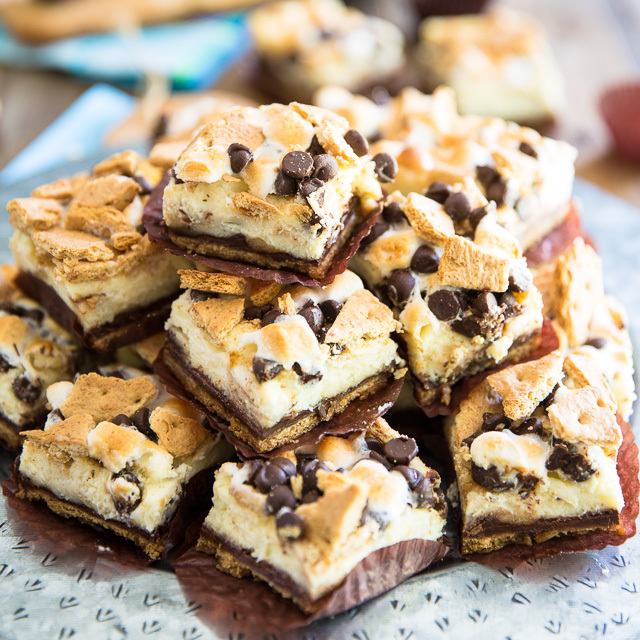 Meanwhile, combine the broken pieces of graham cracker cookies, semi-sweet chocolate chips and mini-marshmallows. 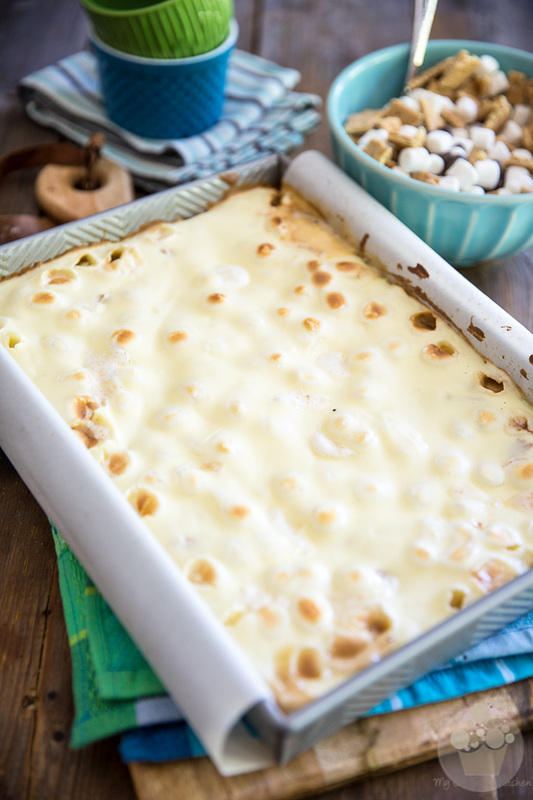 Sprinkle over the cheesecake bars after they have been in the oven for 25 minutes and then resume baking for 8 to 10 minutes, until the marshmallows start to puff up and turn golden brown. 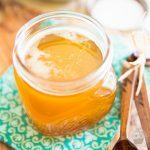 Remove from oven and let cool to room temperature, then transfer the bars to the fridge to chill completely, at least 6 hours but preferably overnight. Cut into bars and store in the refrigerator for up to a week. S’mores and cheesecake. Okay, I’m sold. 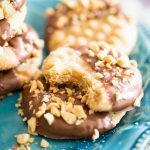 These look ooey and gooey and so stinking addictive- I’ve gotta make them ASAP! 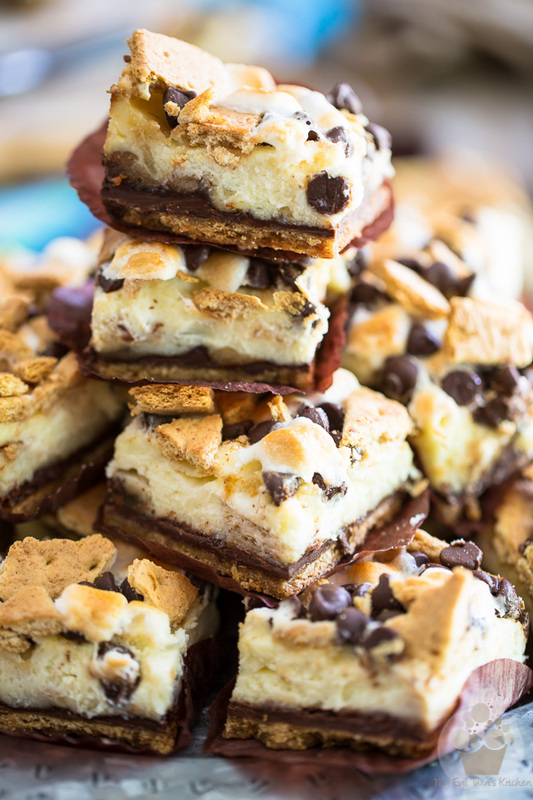 These s’mores cheesecake bars were surprisingly easy to make! They were a hit at our summer barbecue 🙂 thanks for the great recipe!